Do I Need More Insulation? What Is A Whole House Air Purifier? Over 6,137 Installations & 24,137 Happy Customers…and counting. I chose Extreme Comfort to install a 3 ton 16 SEER system. This included the exterior compressor, interior furnace and interior coil. We received two bids. Earle was patient, reasonable and knowledgeable during the quote process and listened to my thoughts and concerns. He did not attempt to oversell me or speed through the process. I felt like I received a reasonable price. On the day of service Tony, Vicente and Noel showed up and got straight to work. They left my home in the same condition they found it and walked me through some of the components of the interior unit, furnace and exterior unit. I will use them to service the unit in the fall and will hope the new system provides great cooling and heat for the next 10-15 years. These guys are the best I have came across. They installed my AC. Repaired my furnace. Thanks Ron, I appreciate the additional tips you gave me. 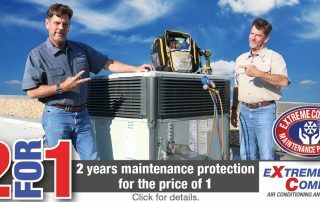 I have used these guys for both AC maintenance, new AC installation and heat maintenance. They have been amazing every time. The two times they came out with a simple fix they waived the fees. Their AC installment was fast, clean, and it worked perfectly. They had a competitive price after getting several quotes. We were planning to go with another AC company, and then they came out to work on it and gave us a lot more information, and we’re totally honest about how we could fix the problem on our own to save money. Eventually AC died completely and we decided to have extreme comfort do the new install. I worked with Tony today to get my heat working and he was awesome and honest. I love this company and will use them from here on out for every AC and heater issue I have. Incredible customer service! THANK YOU!! I had excellent experiences with extreme comfort. They are the best I came across. The jobs are professional. Earle is the best sales. He is very knowledgeable and responsive. The whole ream is great. These guys were great! They were punctual and even vacuumed and mopped after installing 3 residential compressors and furnaces for us. They sent a large enough crew to get it knocked out in 1 day. Pricing was the best of 4 bids. We are very happy customers. Thank you!